You make custom ports of your applications. You would like to use pkg to install them on your production and development machines. Build a poudriere server with portshaker! Everything should run in a jail. Git has many dependencies you don't want on your host systems (I'm looking a you bash). # sysrc -f /boot/loader.conf tmpfs_load="YES"
# sysrc -f /boot/loader.conf linux_load="YES"
# sysrc -f /boot/loader.conf nullfs_load="YES"
# sysrc -f /boot/loader.conf procfs_load="YES"
# sysrc -f /boot/loader.conf fdescfsu_load="YES"
# sysrc -f /boot/loader.conf linux64_load="YES"
# sysrc -f /boot/loader.conf linprocfs_load="YES"
export jail_poudriere_parameters="children.max=20 allow.mount allow.mount.tmpfs allow.mount.devfs allow.mount.procfs allow.mount.zfs allow.mount.nullfs allow.mount.linprocfs allow.raw_sockets allow.socket_af allow.sysvipc allow.chflags enforce_statfs=1 ip6=inherit ip4=inherit"
Hehe, we have a jail in a jail. We're going to build a port tree consisting of the regular FreeBSD main one (using portsnap) merged with our own (using git). Portskaker is an awesome tool. 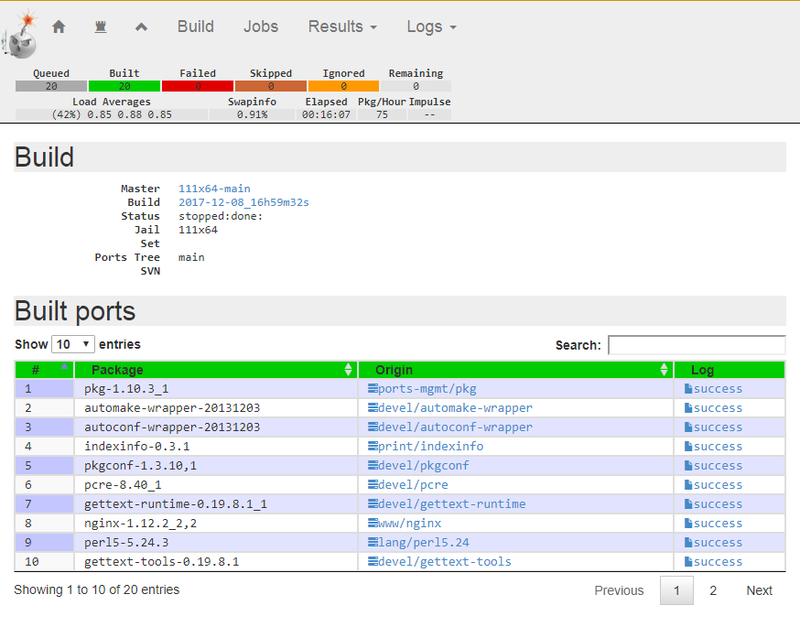 It will merge different port tree, handling conflicts intelligently, and even merging the UIDs/GIDs files properly. This example will only build a single port tree, but you can configure as many as you want. Make sure both files are executable. You should see portsnap and a git clone being executed. You should have a complete port tree in /usr/local/poudriere/ports/main/. Look for your custom ports and check that they're here. We want to use poudriere's web interface. That's it! No CGI, no proxy, no whatever. Just plain files to serve. Writing a secure version of this file is left as an exercise for the reader. Enjoy your new custom ports infrastructure!